I’ve seen this idea posted a few times and I thought it was a cute project for Easter. The best part is, it’s free! I did feel a little sneaky snatching paint chips at Home Depot the other day. I was relieved to read that someone actually called Behr and asked if it was considered “stealing” when taking paint chips for crafts. Behr said that it as NOT stealing! Phew! 1.) 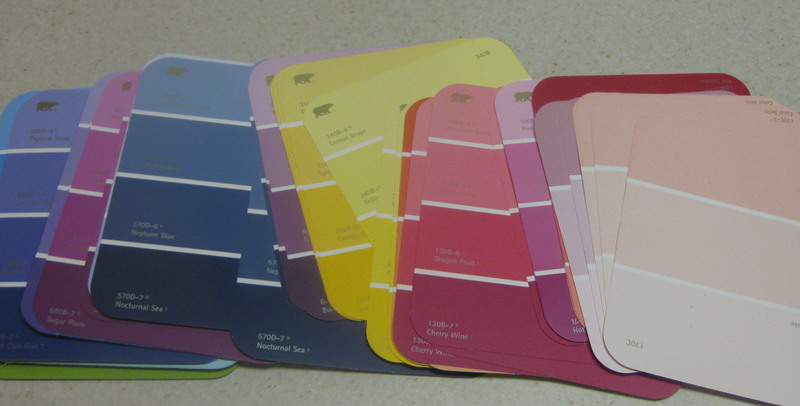 I collected paint chips from Home Depot. 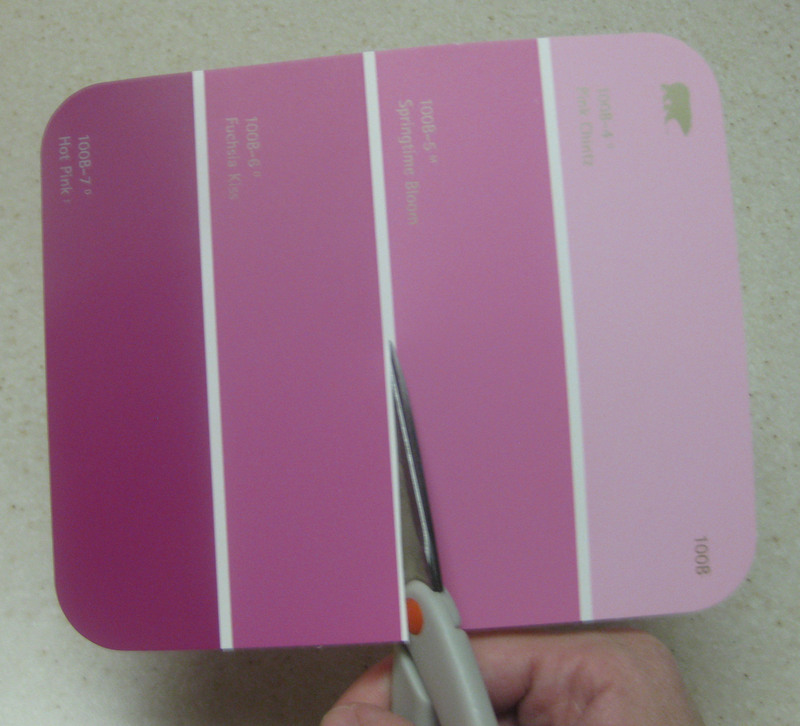 I grabbed the Behr paint chips that have four colors. 2.) I cut my paint chips in half. 3.) I found a picture of an egg by searching in google for “easter egg template”. I copied the picture from the internet and pasted it into Word. Then, I re-sized the image a few times until I got it just the right size. Tip: Make sure to get your template just the right size. If you make it too big, you will cut off some white on to the tips of the eggs. A few of mine have white tips! 4.) 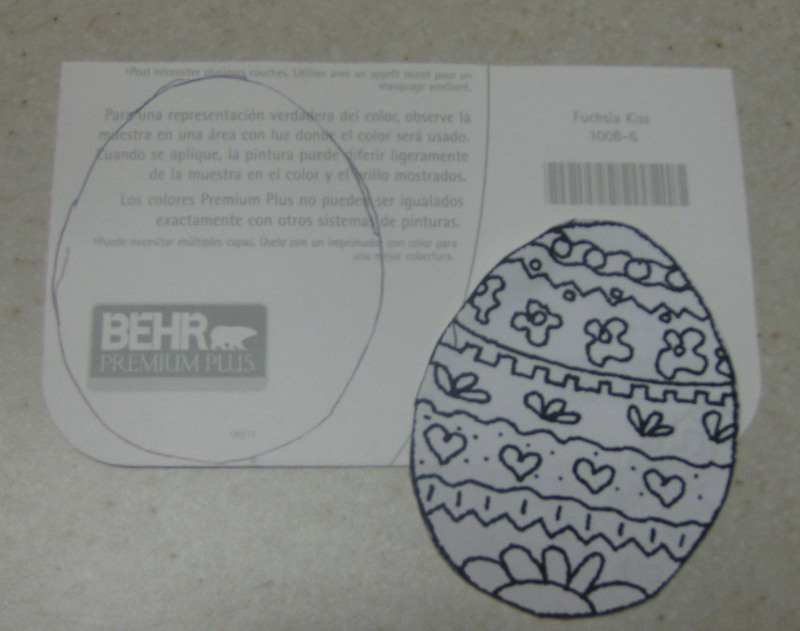 I cut out the egg and traced it onto my first paint chip. 5.) 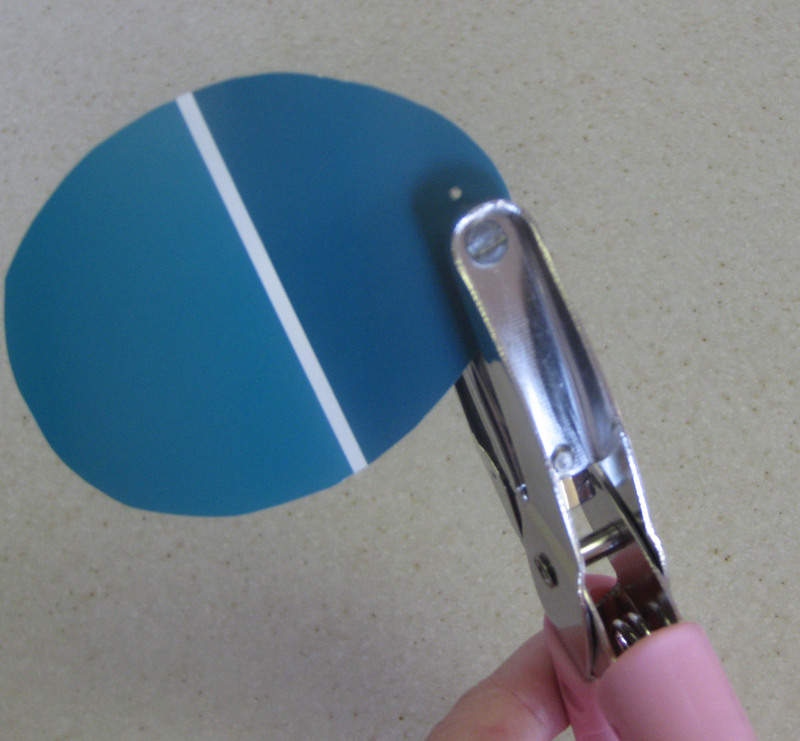 I used my first paint chip as a stencil and traced the egg shape onto all my paint chips. 6.) I cut out the eggs. 7.) I punched two holes at the top of each egg (about 1/4″ apart). 8.) I placed my paint chips in order. My daughter had fun matching the colors in rainbow order. 9.) I threaded the eggs onto the crochet thread. NOTE: I did not pre-cut the thread. 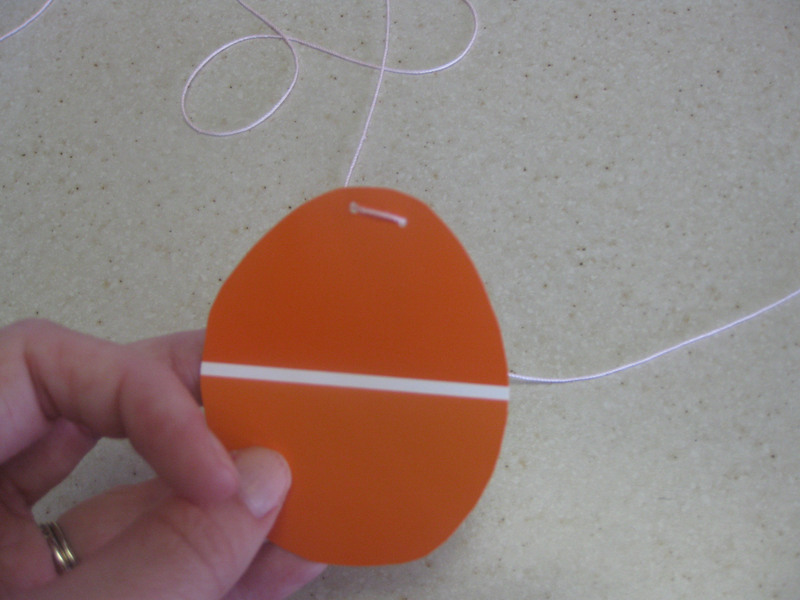 I cut the thread after I threaded all the eggs and after I hung it on my mirror. 10.) 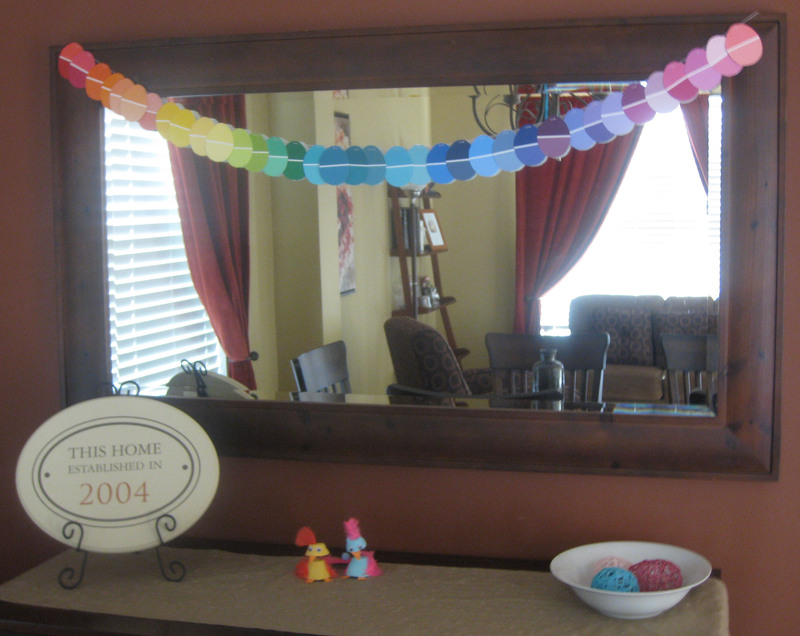 I taped my garland to my dining room mirror and spaced the eggs out evenly. Time: 1.5 hour total. 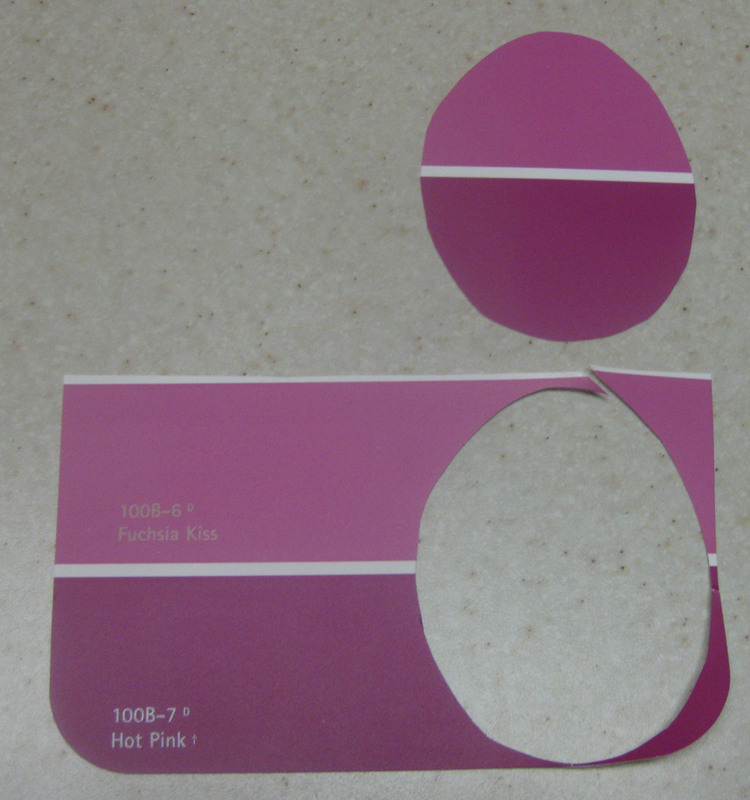 It took one hour to cut the paint chip, trace the eggs, and cut them out. It took another half hour to punch the holes and string the eggs. 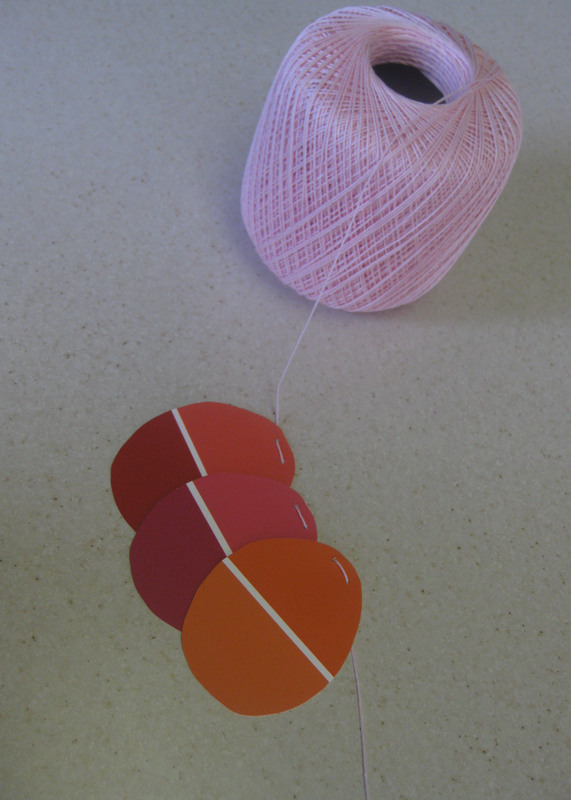 I’m excited about all the fun projects I can create out of paint chips. 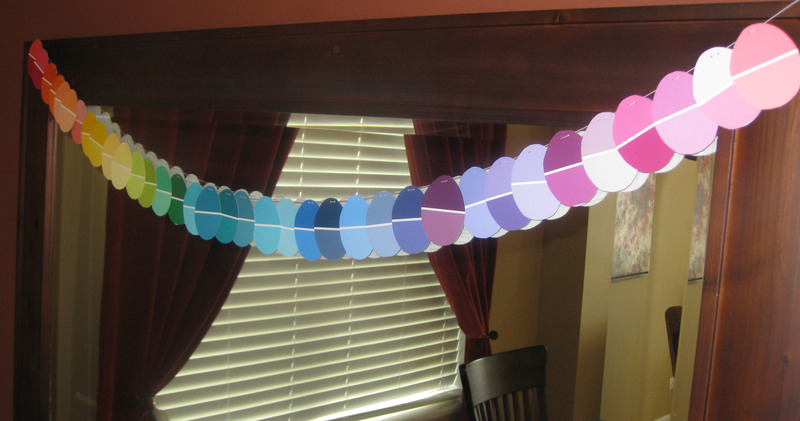 I plan to use the paint chips to make a similar garland (but with circles) for my daughter’s Candy Land/Rainbow themed birthday party (it’s not until September, but I’m getting started early.) I’m also going to make my daughter a paint chip necklace! Also, take a look at my yarn ball eggs (in a white bowl under the mirror). I’ll be posting about this, too. I just want to make more of them first!